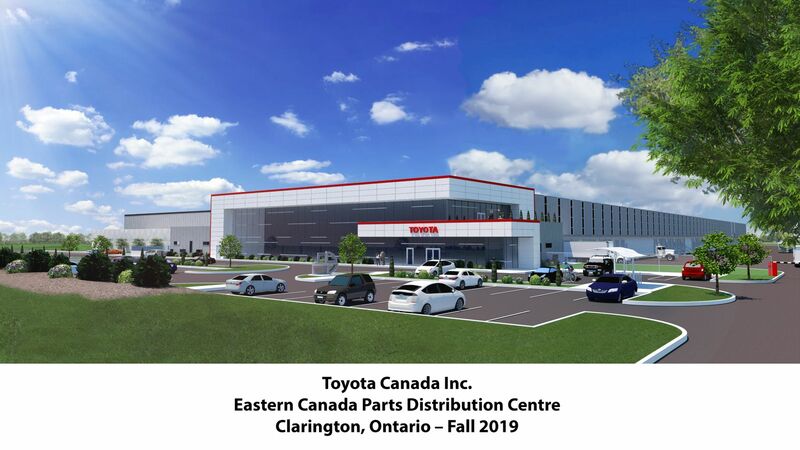 CLARINGTON, Ontario, April 26, 2018 – Toyota Canada Inc. (TCI) kicked off the construction of its newest Canadian facility by revealing a first look at the new building’s design today. The Municipality of Clarington in Ontario will be home to the company’s new Eastern Canada Parts Distribution Centre (ECPDC). Set to begin operations in the fall of 2019, the new 350,000-square foot facility will be built on a 30-acre parcel of land located near the corner of Baseline Road and Lambs Road in Bowmanville. The new location’s direct access to major transportation routes will allow TCI to better service Toyota and Lexus customers and dealerships across Eastern Canada (from Manitoba to Newfoundland). The site also provides plenty of space for future growth. As part of Toyota’s global 2050 challenge, which aims to go beyond zero environmental impact and achieve a net positive impact on the environment by 2050, Toyota is not only focused on eliminating almost all CO2 emissions in its new vehicles, but also in its operations. In fact, Toyota has set a company-wide goal to have zero carbon emissions operations by 2050, and is finding ways to have its new ECPDC facility meet this goal. When it opens its doors in 2019, the new facility will aim to be a LEED silver certified building. For more than 50 years, Toyota has aimed to be a good neighbour in communities across Canada. Today, the company also announced a proposal to donate $410,000 to develop a 600 metre multi-use recreational trail connecting Toyota’s new facility to the existing Soper Creek Trail system. This donation is in addition to a 400 metre trail that the company is constructing behind the new distribution facility. 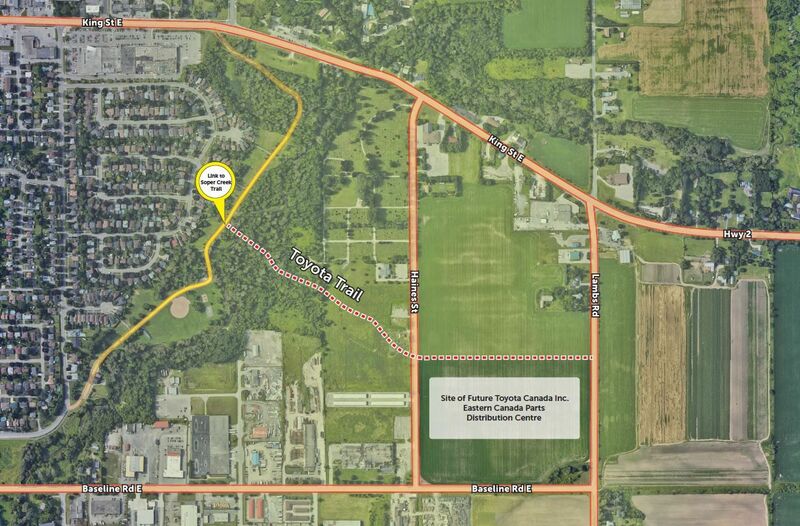 The new “Toyota Trail” will provide a partial link to Clarington’s Waterfront Trail. “Toyota is a great corporate citizen; this is a wonderful proposal. We are pleased to welcome the company to Clarington and we look forward to continuing this partnership,” said Clarington Mayor Adrian Foster.